8. When OSPFv2 neighbors are establishing adjacencies, in which state do they elect a DR and BDR router? 11. Why is MD5 authentication more secure than simple authentication for OSPF updates? 14. 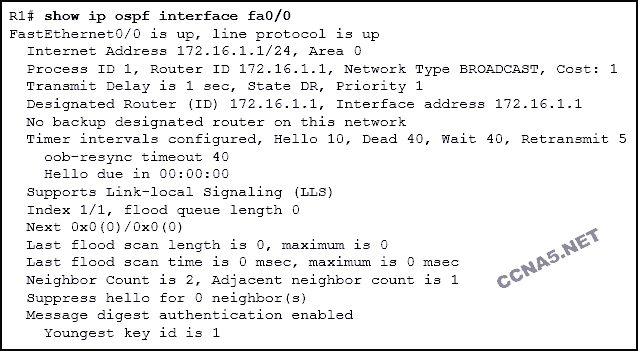 Why do OSPF serial interfaces usually require manual bandwidth configuration? 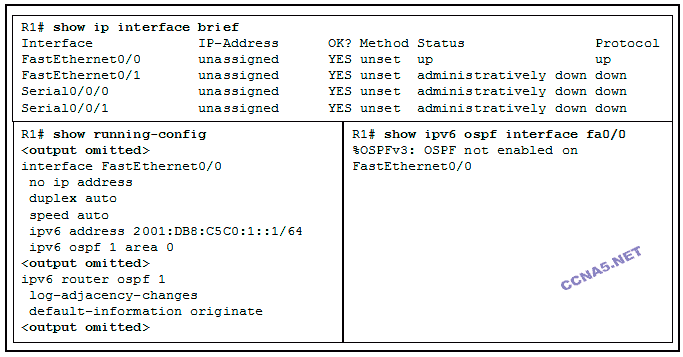 Each side of an OSPF serial link should be configured with a unique value. 15. 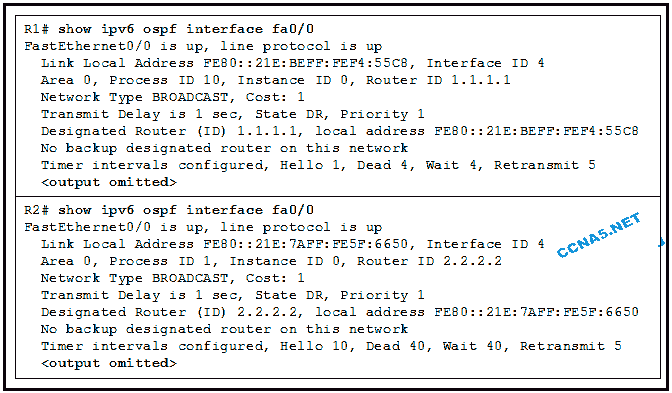 A network engineer is troubleshooting an OSPFv2 network and discovers that two routers connected by a point-to-point WAN serial link are not establishing an adjacency. The OSPF routing process, network commands and area ID are all confirmed as correct, and the interfaces are not passive. Testing shows that the cabling is correct, that the link is up, and pings between the interfaces are successful. What is most likely the problem? 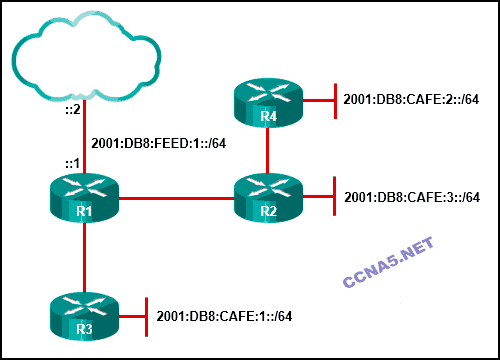 The command (show ipv6 route, SHOW IPV6 ROUTE) can be issued on router R2 to verify the propagation of a static default route from R1 to R2. 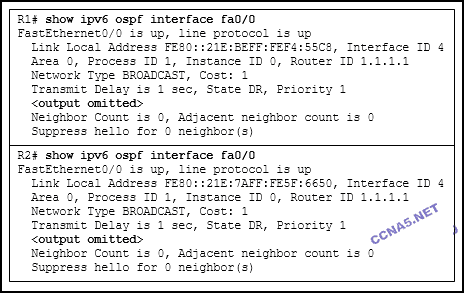 When IPv4 and OSPFv2 are being used, the command (show ip ospf neighbor, SHOW IP OSPF NEIGHBOR) is used to verify that a router has formed an adjacency with its neighboring routers. LSRs and LSUs are used to gain additional route information. Master / slave relationships are negotiated. Elect the router with the highest IPv4 address on loopback interfaces. Elect the router with the highest manually configured router ID. Elect the router with the highest active IPv4 address on physical interfaces. ​All DROTHER routers will send LSAs to the DR and BDR to multicast 224.0.0.5. ​When a DR is elected all other non-DR routers become DROTHER. 26. What is a recommended method of authentication for OSPFv3? 27. A fully converged five router OSPF network has been running successfully for several weeks. All configurations have been saved and no static routes are used. If one router loses power and reboots, what information will be in its routing table after the configuration file is loaded but before OSPF has converged? 29. Open the PT Activity. Perform the tasks in the activity instructions and then answer the question.